Unemployment Rates These are the official unemployment rates for different areas in Illinois (and for comparison, the United States). Measuring Unemployment This section explains the way the U.S. Bureau of Labor Statistics measures unemployment. Unemployment in Illinois and Illinois Cities 1Figures come from the Illinois Department of Employment Security, and are not seasonally adjusted, meaning the effects of regular, seasonal patterns were not taken into account during the calculation process. IDES also archives historical monthly data from 1990 to the present. Why is the U-6 Measurement so much higher? It includes not only the formally unemployed counted by U-3, but discouraged workers and under-employed workers. Discouraged workers are workers who are interested in working but have given up looking for work. Heartland Alliance’s Social IMPACT Research Center provides the most up-to-date unemployment rates by neighborhood. 2Based on the 2011-2015 five-year estimates of the Census Bureau’s American Community Survey. 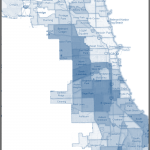 The map on the right, though based on slightly older data, also shows economic indicators such as unemployment and poverty in Chicago neighborhoods.3Created by the City of Chicago, based on the 2006-2010 five-year estimates of the Census Bureau’s American Community Survey. See the full description of the data for more information. IDES prepares a county-level unemployment map for each month. Visit the Bureau of Labor Statistics for unemployment data at the county level for each of the past 14 months. A key indicator of labor market status for a state, county, or city is the unemployment rate. The definition of unemployed according to the U.S. Bureau of Labor Statistics is a person who, “is without work, available for work, and has actively searched for work.” Although the official unemployment rate (U-3) cited most often by the government is defined as, “the total unemployed persons, as a percent of the civilian labor force,” this measurement is only one of six used by the government to understand labor underutilization. The chart below defines all six of the measurements. For more information see this report on unemployment measurements from the Bureau of Labor Statistics. U-1 Person unemployed 15 weeks or longer, as a percent of the civilian labor force.4The civilian labor force is the sum of the employed plus the unemployed. The employed are all persons who, during the reference week, a) did any work at all as paid employees, worked in their own business, profession, or on their own farm, or worked 15 hours or more as unpaid workers in an enterprise operated by a member of their family, and b) all those who were not working but who had jobs or businesses from which they were temporarily absent. The unemployed are a) persons who had no employment during the reference week, were available for work, except for temporary illness, and had made specific efforts to find work sometime during the 4-week period ending with the reference week, and b) persons who were waiting to be recalled to a job from which they had been laid off, regardless of whether they have been looking for work. U-3 (Official Unemployment Rate) Total unemployed persons, as a percent of the civilian labor force. U-5 Total unemployed persons, plus discouraged workers, plus all other “marginally attached” workers6“Marginally attached” workers are persons without jobs who are not currently looking for work, but who nevertheless have demonstrated some degree of labor force attachment. Specifically, to be counted as marginally attached, individuals must indicate that they currently want a job, have looked for work in the past 12 months, and are available for work., as a percent of the civilian labor force plus all “marginally attached” workers. U-6 Total unemployed persons, plus all “marginally attached” workers, plus all persons employed part time for economic reasons. The Labor Force Participation Rate (LFPR) and Employment to Population Ratio provide different ways of measuring the out-of-work population outside of the official unemployment rate. The LFPR is calculated as the employed and unemployed (the labor force) divided by the working-age non-institutionalized population.The LFPR in particular provides an important way of measuring discouraged workers, or workers who desire jobs but have given up looking for jobs, through measuring the drop off in those actively seeking jobs which is not reflected in the official unemployment rate. The Employment to Population Ratio is calculated as the total of labor force employed workers divided by the total working age population of an area. The Employment to Population Ratio helps us understand the level of economic opportunity in a certain area. A high Employment to Population ratio is considered to be above 70%. When the health of the economy, job openings for workers, and economic recovery is reported by the media, the numbers that are frequently highlighted tend to neglect the experiences of the economy for different groups. Use the information below to understand an honest picture of how employment, unemployment, and labor force participation rates vary by different racial groups. Data is specific to Illinois. 1. ￪ Figures come from the Illinois Department of Employment Security, and are not seasonally adjusted, meaning the effects of regular, seasonal patterns were not taken into account during the calculation process. IDES also archives historical monthly data from 1990 to the present. 2. ￪ Based on the 2011-2015 five-year estimates of the Census Bureau’s American Community Survey. 3. ￪ Created by the City of Chicago, based on the 2006-2010 five-year estimates of the Census Bureau’s American Community Survey. See the full description of the data for more information. 4. ￪ The civilian labor force is the sum of the employed plus the unemployed. The employed are all persons who, during the reference week, a) did any work at all as paid employees, worked in their own business, profession, or on their own farm, or worked 15 hours or more as unpaid workers in an enterprise operated by a member of their family, and b) all those who were not working but who had jobs or businesses from which they were temporarily absent. The unemployed are a) persons who had no employment during the reference week, were available for work, except for temporary illness, and had made specific efforts to find work sometime during the 4-week period ending with the reference week, and b) persons who were waiting to be recalled to a job from which they had been laid off, regardless of whether they have been looking for work. 5. ￪ Discouraged workers are a subset of the marginally attached. They must report they are not currently looking for work for one of four reasons. 1) They believe no job is available to them in their line of work. 2) They had previously been unable to find work. 3) They lack the necessary schooling, training, skills or experience. 4) Employers think they are too young or too old, or they face some other type of discrimination. 6. ￪ “Marginally attached” workers are persons without jobs who are not currently looking for work, but who nevertheless have demonstrated some degree of labor force attachment. Specifically, to be counted as marginally attached, individuals must indicate that they currently want a job, have looked for work in the past 12 months, and are available for work.